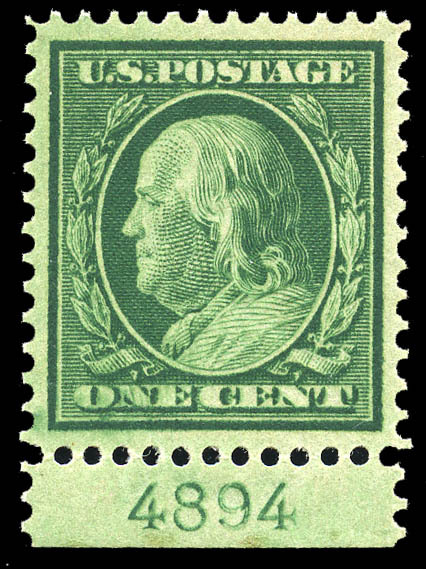 1908, 1¢ green (331), original gum never hinged, exceedingly wide balanced margins, rich color. A choice, Extremely Fine jumbo. SMQ $275. Expertization: with 1998 P.F. and 2007 P.S.E. certificates, the latter graded XF-SUP 95J. 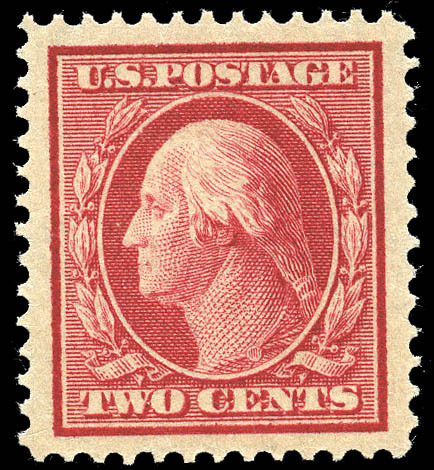 1908, 2¢ carmine (332), original gum never hinged, perfectly centered within jumbo margins, post office fresh. Simply Superb. Unpriced as a 100J, SMQ for a regular Gem 100 $1,250. A TRUE GEM IN THE HIGHEST GRADE POSSIBLE, SHARED BY ONLY THREE OTHERS. Expertization: with 2000 P.S.E. certificate graded Gem 100J. 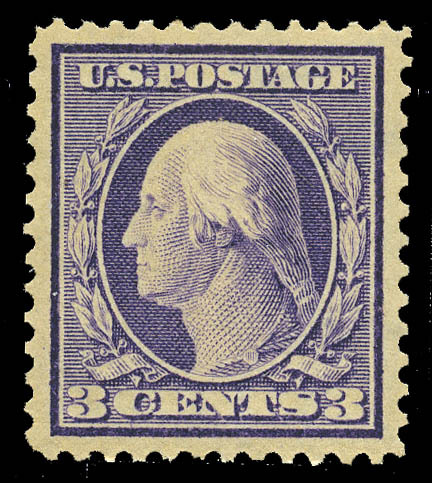 1908, 3¢ deep violet (333), original gum never hinged, flawless centering within near jumbo margins, deep color. Superb. SMQ $1,750. AN IMPRESSIVE GEM 3¢ 1908 ISSUE, THE HIGHEST GRADED AND SHARES THE GRADE WITH ONLY ONE OTHER. Expertization: P.S.E. encapsulated SUP 98. 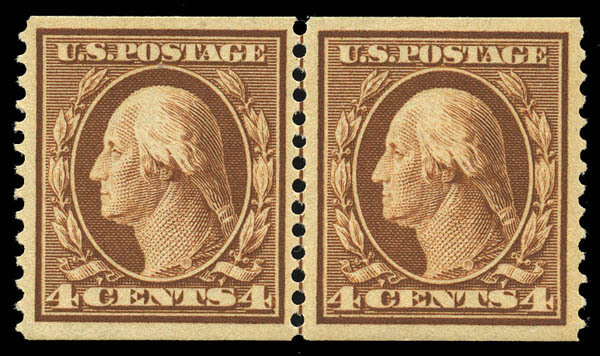 1908, 4¢ orange brown (334), top margin part imprint single, original gum never hinged, mathematically centered within extra wide margins, brilliant color. Superb. SMQ $3,000. 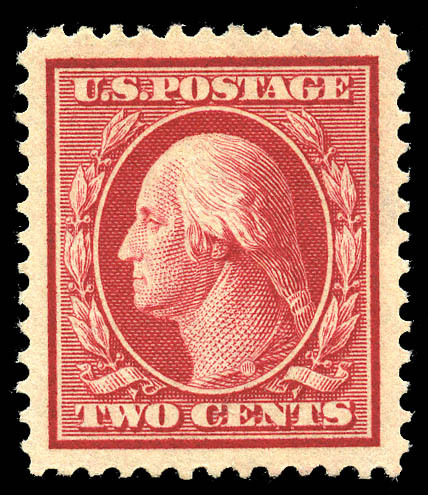 A CHOICE STAMP, THE ONLY ONE AT THIS GRADE AND ONLY TWO HIGHER. Expertization: with 2010 P.S.E. certificate graded SUP 98J. 1908, 5¢ blue (335), original gum never hinged, flawless centering, intense color. Choice Extremely Fine. SMQ $900. Expertization: with 1980 P.F. certificate and 2007 P.S.E. certificate, the latter graded XF-SUP 95. 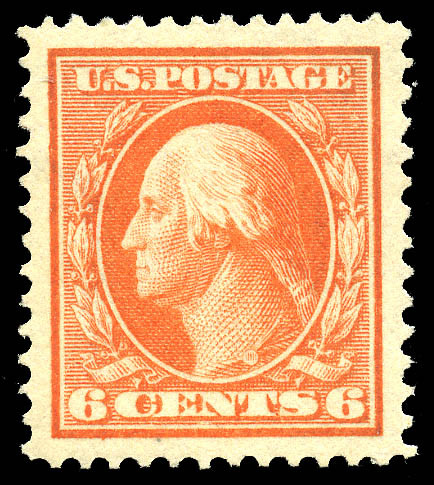 1909, 6¢ red orange (336), original gum never hinged, essentially perfect centering, wide margins, bright color. Superb. SMQ $5,000. A GEM 6¢, ONLY ONE GRADED HIGHER AND ONLY ONE OTHER SHARES THIS GRADE. Expertization: with 1981, 1996 P.F. certificates and 2006 P.S.E. certificate, the last graded SUP 98J. 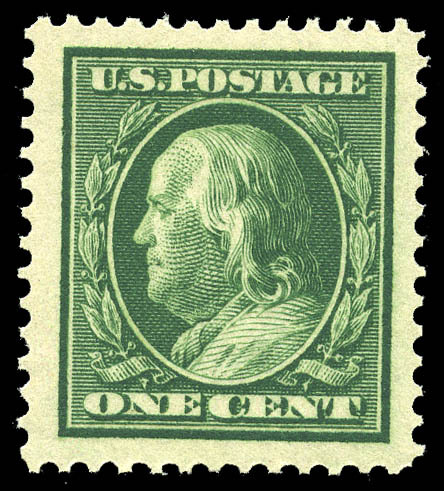 1908, 8¢ olive green (337), original gum never hinged, precise centering, uncharacteristically large margins. An Extremely Fine gem. SMQ $1,400. Expertization: with 1999 P.F. certificate and 2007 P.S.E. certificate, the latter graded XF-SUP 95J. 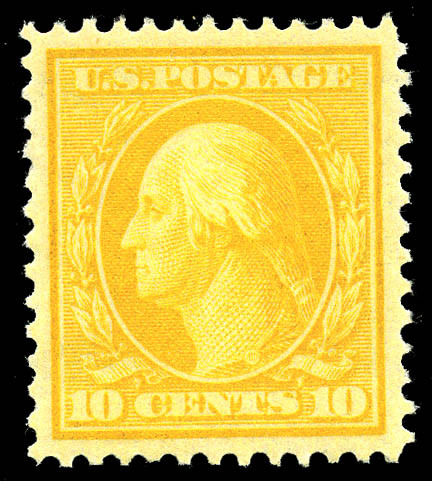 1909, 10¢ yellow (338), original gum never hinged, flawless centering, positively luminous color. Extremely Fine. SMQ $3900. A GEM EXAMPLE OF THE 10¢ 1909 ISSUE, BEING THE HIGHEST GRADED AND SHARING THAT GRADE WITH ONLY TWO OTHERS. Expertization: with 1983 P.F. certificate and 2007 P.S.E. certificate, the latter graded SUP 98. 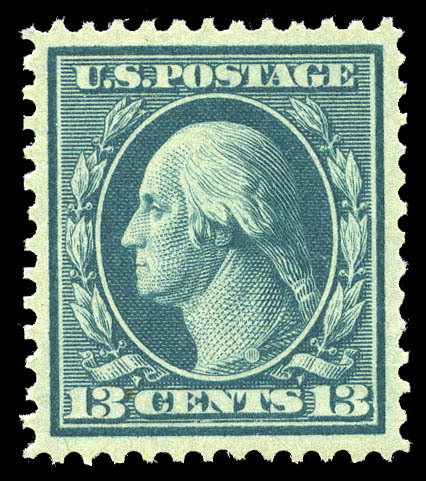 1909, 13¢ blue green (339), original gum never hinged, outstanding centering, post office fresh color and paper. Extremely Fine. SMQ $675. 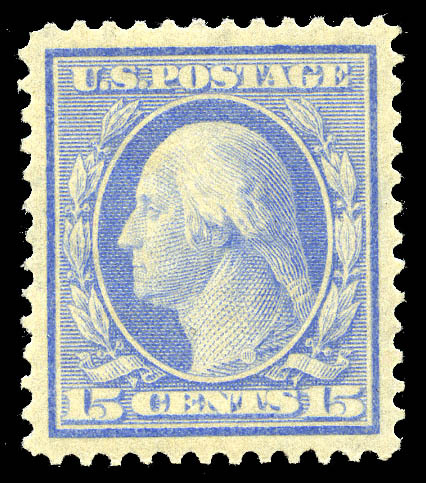 1909, 15¢ pale ultramarine (340), original gum never hinged, impeccable centering within large margins for the 15¢ 1908-09, vivid color. Superb. SMQ $3,750. A STUNNING 15¢ 1909 ISSUE IN THE HIGHEST GRADE AWARDED, AND SHARES THIS GRADE WITH ONLY ONE OTHER. Expertization: with 1979 P.F. certificate and 2001, 2008 P.S.E. certificates, the last graded SUP 98. 1909, 50¢ violet (341), original gum never hinged, virtually perfectly centered, intense color. Choice Extremely Fine, SMQ $4,850. AN EXTREMELY DIFFICULT STAMP TO LOCATE THIS CHOICE, ONLY FOUR OTHERS SHARE THIS GRADE AND ONLY ONE IS HIGHER (A 98). Expertization: with 1981 P.F. certificate and 2010 P.S.E. certificate, the latter graded XF-SUP 95. 1909, $1 violet brown (342), original gum never hinged, outstanding centering, post office fresh with intense color. Superb. SMQ $21,000. 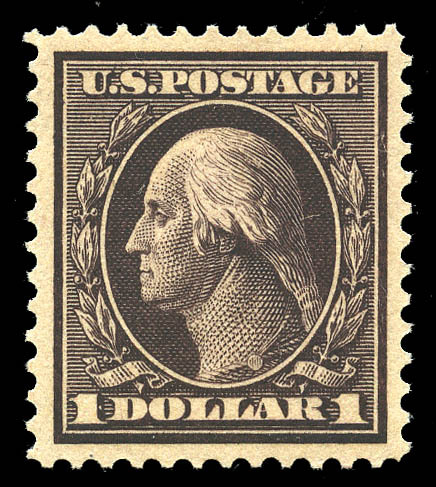 AN INCOMPARABLE $1.00 1909 ISSUE IN THE FINEST QUALITY AVAILABLE, BEING THE HIGHEST GRADED MINT SINGLE OF THIS DIFFICULT STAMP AND THE SOLE EXAMPLE AT THIS GRADE. Expertization: with 1984, 1986 P.F. certificates and 2007 P.S.E. certificate, the last graded SUP 98. 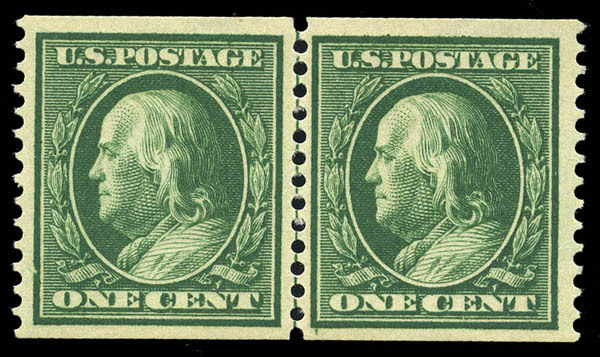 1908, 1¢ green, vertical coil (348), pair, original gum never hinged, perfectly centered, wide margins, exceptionally fresh. Superb. SMQ $1,850. A PERFECT PAIR IN THE HIGHEST GRADE AWARDED WITH ONLY TWO OTHERS AT THIS GRADE. Expertization: with 2005 P.S.E. certificate graded Gem 100. 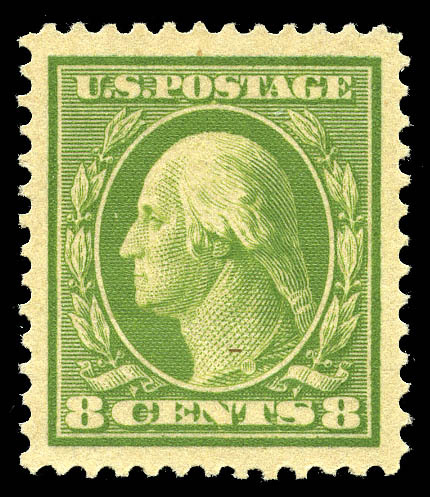 1908, 1¢ green, vertical coil (348), guide line pair, original gum never hinged, fresh and very well centered. Very Fine to Extremely Fine. SMQ $725. Expertization: with 1993 P.F. certificate and 2008 P.S.E. certificate, the latter graded VF-XF 85. 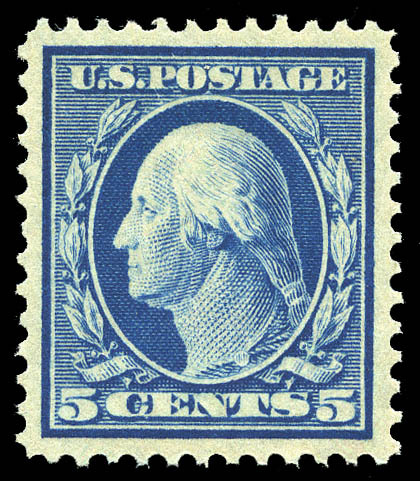 1909, 5¢ blue, vertical coil (351), pair, original gum never hinged, perfectly centered, brilliant rich color on bright paper. Superb SMQ $6,500. AN ABSOLUTELY GEM PAIR OF THIS DIFFICULT COIL, RARELY SEEN IN TOP GRADES, THIS EXAMPLE IS THE HIGHEST GRADED AND THE ONLY ONE AT THAT GRADE, AND TO PROVE HOW SCARCE THIS IS IN TOP GRADES, ONLY ONE PAIR HAS BEEN GRADED 95. Expertization: with 2001 P.F. certificate and 2004 P.S.E. certificate, the latter graded SUP 98. 1909, 1¢ green, horizontal coil (352), guide line pair, original gum never hinged, beautifully centered with wide margins, rich color. Extremely Fine. SMQ $2,750. A CHOICE EXAMPLE OF THIS VERY DIFFICULT LINE PAIR, THE ONLY ONE IN ITS GRADE AND ONLY TWO GRADED HIGHER (90 AND 95). Expertization: with 2008 P.S.E. certificate graded VF-XF 85. 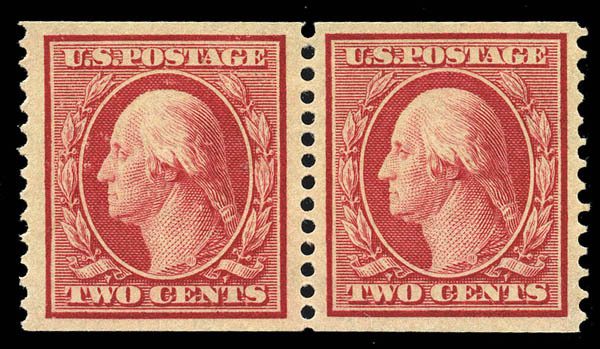 1909, 2¢ carmine, horizontal coil (353), pair, 3mm spacing, original gum never hinged, well centered, bright color. Extremely Fine, the highest graded pair and the only one at that grade. SMQ $1,100. Expertization: with 2008 P.S.E. certificate graded XF 90, with one of Bill Litle's post-it notes "likely worth more as two singles". 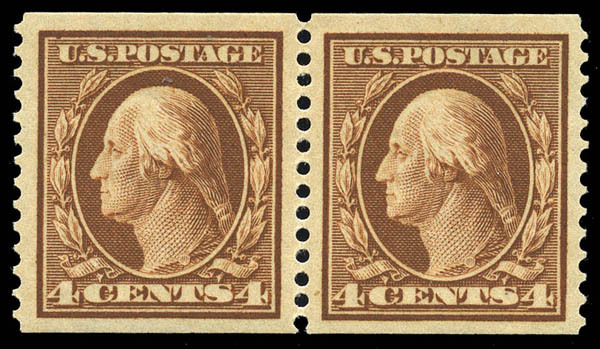 1909, 4¢ orange brown, horizontal coil (354), pair, 3mm spacing, original gum never hinged, perfect centering with very wide margins, brilliant color. Extremely Fine, a choice pair. We feel this is significantly undergraded. SMQ $1500. Expertization: with 1987 PF certificate and 1999 and 2018 PSE certificates, last graded VF-XF 85. 1909, 4¢ orange brown, horizontal coil (354), guide line pair, original gum never hinged, virtually perfectly centered, prooflike color and impression. Extremely Fine. We feel this line pair has been significantly undergraded. SMQ $3000. AN EXCEPTIONAL NEVER HINGED EXAMPLE OF THIS SCARCE LINE PAIR. Expertization: with 1993 P.F. certificate and 2018 PSE certificate, latter graded VF 80. 1909, 1¢ green, bluish paper (357), bottom plate no. 4899 single, original gum never hinged, virtually perfectly centered, rich color. Superb. SMQ $3,500. A GEM 1¢ ON BLUISH PAPER, ONLY ONE GRADED HIGHER (98J) AND ONLY FOUR OTHERS SHARE THIS TOP GRADE. 1909, 2¢ carmine, bluish paper (358), original gum never hinged, amazingly well centered within huge margins, beautiful color on deeply blued paper. Superb. SMQ $4,500. A GEM 2¢ ON BLUISH WHICH IS SURPRISINGLY SCARCE IN TOP GRADES, ONLY TWO HAVE GRADED HIGHER (100), THIS IS THE ONLY ONE AT THIS GRADE. Expertization: with 1984, 2006 P.F. certificates and 2008 P.S.E. certificate, the last two both graded SUP 98J.